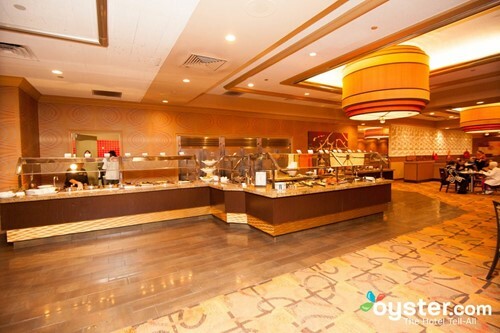 This is the place you'll find whatever you're in the mood for from our all-you-can-eat spread on our classic Atlantic City buffets. For breakfast, lunch and dinner, you'll always have the option to eat a little or feast on a lot. Please come and enjoy any of our wonderful meals, from our daily Atlantic City breakfast buffet, scrumptious lunch options, or a family dinner! Went for Sunday brunch $40 per person. Lots of baked goods. The crab legs (the featured item) were biiled till no goodness left. Went through 6 halves got to bites of meat . Rest of buffet was run of the mill and not very good selection. Staff was inattentive and standoffish. Could not get a water for my wife. We will not return. As always Harrah's Waterfront doesn't disappoint. I don't know who cooks here, but they are GREAT! Plenty to choose from and the desserts are deliciously tasty. Visited Harrahs Waterfront Buffet. They have a great selection of dishes to choose from. The crab legs are pretty good. Not very seasoned however. The pepper steak was awesome. There has been a price increase since my last visit however so a bit pricey overall. Service was quick and efficient. Things have changed there the crab legs are NO LONGER UNLIMITED. You pay the same price as before but they give you 2 tickets per person for the crab legs. When you go to the crab legs station you give server ticket and you get 4 sets of legs. So you get a total of 8 sets of crab legs. NO EXTRA. When i was there on 3/24/18 the legs were skinny very little meat. As far as the other food nothing to write home about. Plus our waitresses was BAD. She was missing for long periods of time and my table was a mess. I dont think I will be back. If I do go back it's because of good experiences in past. I think buffet here is amazing. Infinite selections of items. Nice ambience and a courteous staff makes for a great meal at Harrah's. The price is a bit high I think with very little discounts available unless you get it comped which I don't spend that much as of now. Never had a bad meal here, always been happy with the meal.